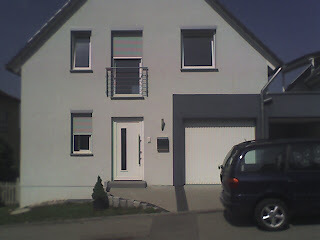 Well, the time has come to say goodbye to Doeffingen. We are here to clean up and hand over the keys. We loved this place and hate to let it go but God has some great plans for us in Switzerland which we do not want to miss. Beate is right here and wants to finish up the large windows on the other side of the house. We will move out here and are looking for our next abode in Baar/Zug. See the next pic to see the windows. I mentioned sometime ago that I would explain the process. This is applicable mostly to those of you who are in the USAREUR (US Army Europe) system and want to get your cars into the German system. Why would you want to do that you might ask. Well if you want to sell your car to a German there is reason 1. If you are retiring here then that is another reason. Or like me you are moving to a third country in the EU/Europe. 1. )Get a Unbedenklichkeitsbescheinigung. This is given by the Zollamt (Customs Office) where the car will be registered. 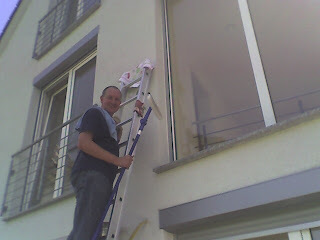 I live in the county of Boeblingen so I went to the office for this Kreis (County). 2. )Your car must pass the Tuev inspection. They will issue you a certificate saying you passed or failed and what you need to do to fix the car. WARNING # 1: If your car has USAREUR plates when you get the inpection they WILL fail you. However, this is not a problem as they say it will pass as soon as you have German plates. WARNING #2: You also need to get a abgassbescheinigung (Smog Test certificate). When you make the appointment for the Tuev make sure and ask for the smog test as well. I had to have the inspection done a second time because I did not have the right paperwork. 4.) Go to your POV point in your community. In Stuttgart, it is at Panzer and the ladies there will help you out. Heidi and Gisela are both very knowledgeable and speak marvelous English. You will need to ask for a Request for POV Registration cancellation. They will take your plates at this time, so it is important to have a buddy to get you to the German auto registration to get your German plates. There are some fine points that I will mention in my next post. 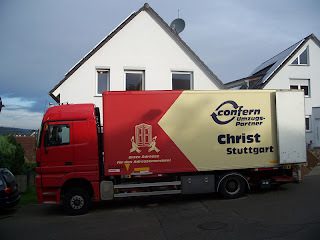 Well the day has arrived and we are moving out of our house in Doeffingen. It has been a nice time but we are ready for our Swiss adventure to begin. Jeff started work last week in Baar and he is enjoying himself. Beate, Samuel and Marlene are having a small vacation at Oma and Opas until we find a place in Switzerland.